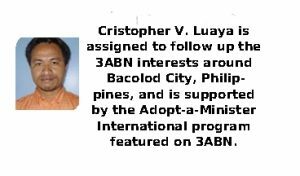 Have you ever wondered how 3ABN is making a difference around the world? Let me tell you the story of a lady whose life has been changed dramatically by 3ABN’s ministry! Eva Duenas lives in Bacolod City, Philippines, and tells us that her search for God has been a long journey. “I grew up as a nominal Catholic, without a solid foundation of truth,” she says. Before her encounter with the Lord, Eva had encountered many Christians she hadn’t liked so well. She even called people who gave her tracts and other reading materials “Bible fanatics.” But there was a hole in her heart that nothing seemed to ill, and God’s love for this lady was such that He put a wonderful plan into action. Eva began attending meditation centers, but once again her spiritual hunger was not satisfied. From time to time she had watched many of the different religious TV channels available in the Philippines, but always found herself feeling empty and confused after a while. Then one day Eva found one of her friends reading a Bible. As she looked at the passages her friend was highlighting, she was intrigued. he more she read, the more it began making sense. It wasn’t long before she had bought her own Bible and they began having Bible study sessions together. Eva’s hunger for more knowledge of the Scriptures continued to grow as she studied, and she began buying and borrowing other religious books anywhere she could find them. But this was only the beginning. 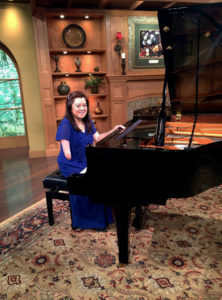 The Lord heard and answered her prayer for a TV station that would help her understand the Bible truths. What a wonderful day it was when she discovered a different kind of TV channel on her cable system—one that seemed to it her needs. It was 3ABN, and for the first time Eva became acquainted with the Bible truths Seventh-day Adventists believe. From then on, she was “hooked” on 3ABN. She says her favorite programs were the ones with music, a nd the Voice of Prophecy. It seemed like she just couldn’t get enough. “The more I watched 3ABN, the more I became curious to attend a Seventh-day Adventist church,” she says. “I would sit there and wish somebody would invite me to an Adventist worship service.” One day she saw a free book offer and a local number on her screen as she watched 3ABN. Eagerly picking up the telephone, she called and was answered by Mrs. Joebenie L. De Villa. Although she was a busy chairperson at the Central Philippines Adventist College, Mrs. De Villa had volunteered to answer telephone calls for the free offers at her home. Soon Eva came by to claim her free books, and while she was there, she asked Mrs. De Villa about where she might find even more books. You cannot imagine her delight as she was directed to the local Adventist Book Store only a few meters across the street! And, of course, her prayer was answered when she was invited to attend the Bacolod Adventist Center Church. Can you imagine the joy Eva must have felt that first Sabbath? I’m sure the angels were rejoicing as she made her way there that day. Eager to learn more, Eva arranged to have Bible studies with Pastor Josue Subang and then another church member. Finally she was getting answers to her perplexing problems. “I studied the entire truth I needed to know. It was so clear, understandable and convicting. I am so happy I found the truth. God answered my prayer through 3ABN!” she says. But that’s not the end of the story. After discovering the treasures of God’s Word, Eva could not keep it all to herself. Today this precious lady goes door to door working as a literature evangelist. Every day she meets precious souls who are thirsting for truth, like she did. Eva gives them an opportunity to obtain literature that explains the precious truths of the Bible. We praise the Lord for all of you who continue to sup port 3ABN’s ministry around the world. Your prayers and love gifts are what make it possible for us to reach people like Eva, and you are truly making a difference in the lives of millions!